I’m currently sitting at home with my dad who just had hip surgery. He’s doing great and resting comfortably :). I’ve had a lot of time on my hands today so I thought it would be fun to post a few throwbacks of little Ashley for you guys! Have you ever seen anyone happier to be sitting in a laundry tub of lukewarm water?? I haven’t. Bath time and snack time were/still are my favs. 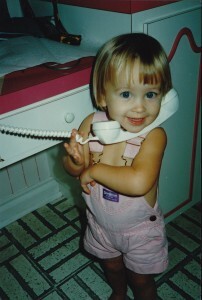 I like to think that this was the start of my ‘awkward stage’. 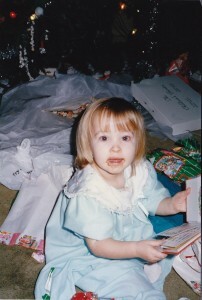 I don’t know if it’s the bowlcut, or the inability to eat without getting food all over my face (which I never quite grew out of), but either way, it was a tough time for Ashley. Don’t act like you’ve never done business in nothing but a pair of jean short overalls. 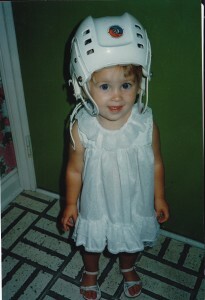 At this point in my life, I actually thought I might be a hockey player. After it was established that I was born without hand/eye coordination or any real skill involving sports at all, I figured the next best thing was to marry a hockey player. Close enough. But seriously, this broad loves a bath. 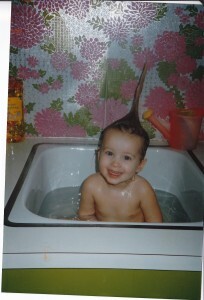 PS: I can still be found making the same face, and same Mohawk every time I take a bath. Ok, I think that’s enough excitement for one day. Don’t miss Ashley Leggat on Periscope! 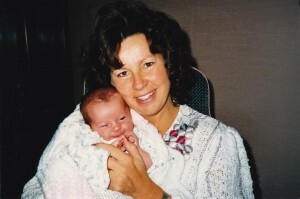 I saw the resemblance between you and your mama before but wow! TWINS! Two gorgeous ladies, seriously! I must say I was pretty adorable as a child but I think most of my photos are “derp faces”, you seem to have gotten lucky haha. She did! I don’t know how she did it with 4 boys and me!